JazzCorner.com is the largest portal for the official websites of hundreds of jazz musicians and organizations with more than a 1/2 million pages views a month. We pioneer practical methods of using technology to benefit the Jazz community, and offer customized solutions for individual Jazz musicians as well as Jazz organizations and businesses. JazzCorner.com custom designs and hosts websites as well as provide links from musician's sites to the JazzCorner.com portal. Features on JazzCorner.com include: the JazzCorner Jukebox where you can stream hundreds of free tunes from musicians that are part of JazzCorner.com. We are also a Google news aggregator. JazzCorner podcasts with established and up-and-coming jazz musicians were named "Best Music Podcast" by Southwest Airlines and are available for free through the site or on iTunes. If you want to be part of JazzCorner.com, please contact us for more information. Born in Chicago, Chris was playing drums at age three and began performing his first professional gigs at eleven. At nineteen, Parker began recording and touring with blues great Paul Butterfield and broke into the New York studio scene in 1970, doing records, movie scores and filling the drum chair at Saturday Night Live. 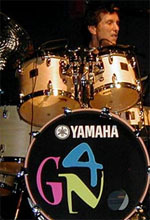 Toph, as friends know him, recorded platinum, gold and Grammy winning albums and CDs with many artists, including the original Brecker Brothers, Bob Dylan, Cher, Donald Fagen, Ashford and Simpson, Natalie Cole, Aretha Franklin, Freddie Hubbard, James Brown, Joe Cocker, Salt 'n' Pepa, Stuff, Miles Davis, Patti LaBelle and Michael Bolton. He has toured with many artists; among them Boz Scaggs, Joe Cocker, Bob Dylan, Bette Midler, Paul Simon and Ralph Mac Donald. Michael Brecker recently spoke of Parker, in Modern Drummer Magazine, "...Like Harvey Mason, Chris (is) also a natural drummer with great musicianship and a strong feel for funk." Also in a recent Modern Drummer issue, Tom Scott said, " Chris Parker is one of the sweetest human beings on the planet."